The bone yard beach on Capers Island is a misnomer. You don’t find bleached whale bones here. Instead, it’s a graveyard for deceased trees, those that have lost their battle to stand up to the relentless pounding surf. 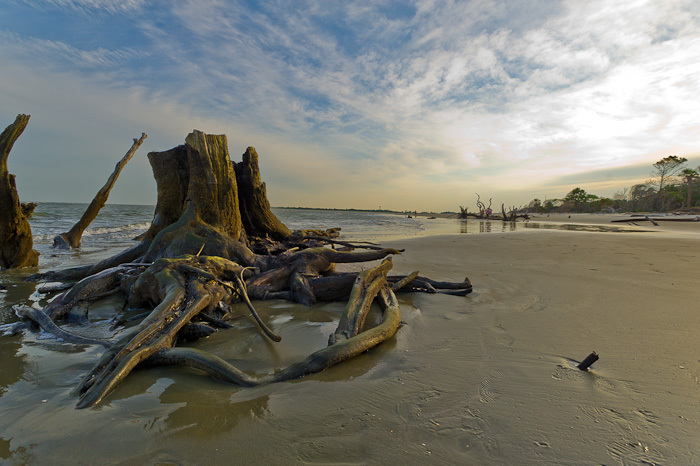 We traveled to Capers Island on a Barrier Island Eco Tour from their home base on Isle of Palms, where we spent nearly an hour exploring the beach, filled with petrified trees, various crabs, abundant shells and other small creatures. Capers Island is designated a Heritage Trust Preserve because it’s one of the few barrier islands that’s been left in a natural, undeveloped state. The naturalists leading our tour showed us how Capers Island is continually shifting and regenerating, moving ever so slightly southward each year due to the tidal forces. Because we didn’t see any dolphins or turtles on this tour as was expected, I was able to focus on this desolate beach and the landscape, which provided more than enough inspiration on this beautiful South Carolina evening. Amazing photo – the composition, the light and the sky is great and frames these beautiful deceased trees so well. Nice work! Very nice shot, I love the perspective. I would love to visit this place! I appreciate your comment! I do hope to go back again in the early morning. It’s a wonderful place. Amazing that we have never been there or even heard of it in all of our trips to Isle of Palms. Will you give us a tour next time? GORGEOUS. Love, love the braided mane border!!! What a lot of work and so neat and even.